Blood vessels within human skeletal muscle harbor several multi-lineage precursor populations that are ideal for regenerative applications. This isolation method allows simultaneous purification of three multipotent precursor cell populations respectively from three structural layers of blood vessels: myogenic endothelial cells from intima, pericytes from media, and adventitial cells from adventitia. Chen, W. C., Saparov, A., Corselli, M., Crisan, M., Zheng, B., Péault, B., Huard, J. Isolation of Blood-vessel-derived Multipotent Precursors from Human Skeletal Muscle. J. Vis. Exp. (90), e51195, doi:10.3791/51195 (2014). Human skeletal muscle has been considered a clinically attractive source of stem/progenitor cells. Skeletal muscle contains not only committed myogenic progenitors, skeletal myoblasts, but also primitive myogenic stem cells, including satellite cells and muscle-derived stem cells (MDSCs)1. The use of human muscle-derived stem/progenitor cells, autologous or allogeneic, in regenerative medicine has been extensively investigated in pre-clinical animal models and clinical trials. The regenerative applications of muscle stem/progenitor cells range from regenerating the dystrophic muscle in Duchenne muscular dystrophy (DMD) patients to repairing the injured heart in patients with heart attack. Since the discovery of mesenchymal stem/stromal cells (MSCs) and other multipotent precursor cell populations, including bone marrow-derived multipotent adult progenitor cells(MAPCs) and adipose-derived stem cells (ADSCs), adult stem/progenitor cells have been extensively investigated to date1-9. Nevertheless, their native identity and localization in situ have been obscured by the retrospective isolation methods. Recently, using fluorescence-activated cell sorting (FACS), we and other groups have prospectively identified and purified three multipotent precursor cell populations from blood vessels within human skeletal muscle and several other organs: myogenic endothelial cells (MECs), pericytes (PCs), and adventitial cells (ACs)10. These three subpopulations of human blood-vessel-derived stem cells (hBVSCs) can be respectively found in the three structural layers of blood vessels: tunica intima, tunica media, and tunica adventitia. More specifically, MECs and PCs are detected in microvessels and capillaries while ACs are localized in the adventitia layer of larger arteries and veins. 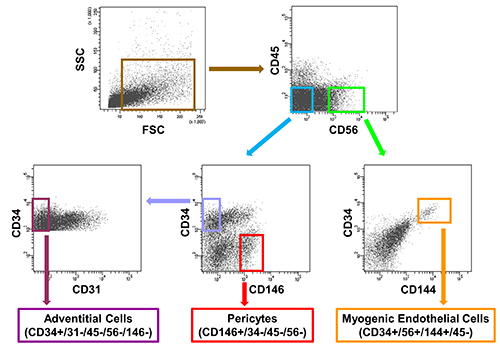 Each precursor cell subset expresses a unique combination of cell surface antigens: MECs (CD34+/56+/144+/45-), PCs (CD146+/34-/45-/56-), and ACs (CD34+/31-/45-/56-/146-). Further characterization of these hBVSC subsets revealed that all three precursor cell populations possess mesodermal developmental potentials similar to typical MSCs, including skeletal myogenesis, osteogenesis, chondrogenesis, and adipogenesis. All hBVSC subsets also exhibit classic MSC markers, including CD44, CD73, CD90, and CD105, freshly and in culture. Collectively these pieces of evidence supported the vascular origin of MSCs. Moreover, the therapeutic capacities of MECs, PCs, and ACs have recently been demonstrated in separate studies. MECs sorted from adult human muscle biopsies were shown to regenerate injured and dystrophic skeletal muscles and repair injured myocardium more efficiently than skeletal myoblasts and vascular endothelial cells (ECs). Purified PCs from different human organs have also been shown to repair/regenerate injured and dystrophic skeletal muscles and contribute to the satellite cell pool13-16. Very recently, we have demonstrated that PCs derived from human skeletal muscle effectively repair the infarcted myocardium through indirect paracrine effect and direct cellular interactions17. ACs, on the other hand, have been either directly isolated from explanted blood vessels or purified by FACS from human adipose tissue and skeletal muscle. A notable pro-angiogenic effect of ACs was demonstrated in a mouse hind-limb ischemia model19. Furthermore, ACs have also been shown to repair infarcted myocardium more efficiently than conventional MSCs, indicating the robust therapeutic potential of ACs in ischemic tissue repair20. The current purification protocol grants simultaneous, prospective purification of MECs, PCs, and ACs from the vasculature of a single human skeletal muscle biopsy. This allows us to study and/or choose the optimal hBVSC subpopulation for distinct therapeutic purposes. Additionally, this new technique further expands the repertoire of stem/progenitor cells that can be derived from human skeletal muscle, making it an ideal source of multipotent precursor cells for regenerative medicine. Preserve human skeletal muscle biopsy on ice in Dulbecco's Modified Eagle Medium (DMEM)supplemented with 5% fetal bovine serum (FBS) and 1% Penicillin-Streptomycin (P/S) during transportation. After the receipt of the muscle biopsy, remove the specimen from the transportation container and wash it twice in phosphate-buffered saline (PBS) supplemented with 2% antibiotic-antifungal solution (A/A) under sterile conditions. Remove the attached adipose and connective tissue with sterile scissors and forceps in DMEM supplemented with 2% A/A. Remove large blood vessels under dissection microscope and subsequently cut the muscle specimen into small pieces (< 1 cm2 in size). Preserve cut muscle pieces (<5 grams) in 20 ml preservation medium (PM; DMEM supplemented with 10% FBS and 1% P/S) at 4 ℃ for up to 5 days. On the day of cell isolation, remove muscle pieces from PM and wash twice in PBS supplemented with 2% P/S. To make the digestion solution, add type-I, type-II, and type-IV collagenases (100 mg/ml) freshly into PM. Finely chop and mechanically mince muscle pieces with sterile scissors and forceps in a petri-dish with a small amount of PM until the solution passes 10 ml serological pipette with no clotting. Remove the residual adipose and connective tissue during this process. Use at least 8-10 grams of adult muscle or 2 grams of fetal muscle for each cell isolation. Transfer 4-5 grams of minced adult muscle to 20 ml (or 2 grams of minced fetal muscle into 10 ml) ofthe digestion solution with a 10 ml serological pipette. Digest for 50 - 60 min at 37 ℃ on an orbital shaker at 70 - 80 rpm. Optimize cell yield and surface antigen preservation by adjusting the digestion time and/or agitation speed accordingly based on the amount of tissue. Observe the digestion status every 15-20 min until the turbidity almost clears. Vigorously pipette the digested tissue 3-5 times with a 10 ml serological pipette. Add equal amount of PM to stop the reaction and then centrifuge at 400 x g for 4 min. Carefully remove the supernatant; resuspend the pellet with 10 ml PM to wash, and then filtered through a 100 μm cell strainer. Centrifuge at 400 x g for 4 min and carefully remove the supernatant. Resuspend pellets in erythrocyte lysis buffer (155 mM NH4Cl, 10mM KHCO3, 0,1mM EDTA), filter through a 70 μm cell strainer to obtain a single cell suspension, and then incubate for 10 min at RT. Filter through a 70-m cell strainer again if any precipitation is observed. Centrifuge at 400 x g for 4 min and resuspend the cell pellet in 0.5 ml PBS. Count the number of cells. Obtain a total of at least 5 million cells for cell sorting. Dilute the single cell suspension to less than 5 million cells per ml with PBS for staining. Take out 50-100 μl of the cell suspension and split into 11 tubes for control stainings (unstained control, negative controls, and single-color positive controls). Incubate the single cell suspension for 10 min at 4 ℃ in mouse serum (diluted 1:10 in PBS) for blocking purpose if necessary. Add CD34-APC,CD45-APC-Cy7, CD56-PE-Cy7, CD144-PE, and CD146-FITC (all 1:100) into the single cell suspension and incubate for 20 min at 4 ℃. For negative control, add equivalent concentrations of APC-, APC-Cy7-, PE-Cy7-, PE-, and FITC-conjugated isotype IgG antibodies and incubate for 20 min at 4 ℃. For single-color positive controls, add equivalent concentrations of CD34-APC, CD45-APC-Cy7, CD56-PE-Cy7, CD144-PE, and CD146-FITC individually into each tube and incubate for 20 min at 4 ℃. After incubation, centrifuge at 400 x g for 4 min to wash. Resuspend the cell pellet in 1 - 2 ml DMEM supplemented with 5% FBS and 1% P/S. The final concentration of the cell suspension should be less than 5 million cells per ml. Add 7-AAD (1:100) and incubate for 15 min at RT for dead cell exclusion. For negative control and single-color positive controls, resuspend cell pellets in 0.5 ml DMEM supplemented with 5% FBS and 1% P/S. Transfer all cell suspensions to round-bottom polystyrene flow cytometry tubes. Prepare cell collection tubes (each tube is pre-filled with 500 μl of the appropriate culture medium: MPM for MECs; EGM-2 for PCs; AC medium for ACs). Transport cell suspensions on ice to the cell sorter. Run cell suspensions on the cell sorter in the order of the unstained control, negative controls, single-color positive controls, and the main cell suspension while adjusting laser intensity, channel compensation, and cell population gating stringently to maximize cell purity (please refer to articles published by JoVE and other journals for details of flow cytometry). Collect desired cell populations in the appropriate collection tubes. Store collected cells at 4 ℃ if not seeding immediately. Seed freshly sorted MECs (P0) at <10,000 cells/cm2in MPM onto plates pre-coated with type-I collagen. For subsequent passaging of MECs, seed 3,500 - 4,000 cells/cm2 in MPM onto plates/flasks pre-coated with type-I collagen. Seed freshly sorted PCs (P0) at <20,000 cells/cm2 in EGM-2 onto plates freshly coated with 0.2% gelatin. For subsequent passaging of PCs, split cells at 1:3 ratio in PC medium (DMEM supplemented with 20% FBS and 1% P/S) onto regular polystyrene culture plates until P2. From P3 onward, seed cells at 6,500 - 7,000 cells/cm2 in PC medium onto regular polystyrene culture plates/flasks. Seed freshly sorted ACs (P0) at <20,000 cells/cm2 in AC medium (DMEM supplemented with 20% FBS and 1% P/S) onto regular polystyrene culture plates. For subsequent passaging of ACs, seed cells at 6,500 - 7,000 cells/cm2 in AC medium onto regular polystyrene culture plates/flasks. FACS parameters are first corrected based on the data obtained from the unstained control, negative controls, and single-color positive controls. After exclusion of dead cells, fluorescence-labeled cell suspension is subjected to a series of negative and positive cell surface marker selections. First, CD45+ cells are gated out before CD56+ and CD56- cells are separated from the CD45- fraction. The CD56+ fraction is further subjected to CD34-CD144 selection where only CD34+/CD144+ (dual-positive) cells are marked as MECs (CD34+/56+/144+/45-) and subsequently collected (Figure 1). Similarly, the CD56- fraction is further subjected to CD34-CD146 selection where only CD34-/CD146+ cells are marked as PCs (CD146+/34-/45-/56-) and subsequently collected (Figure 1). The CD34+/CD146- fraction is subjected to an additional negative CD31 selection to exclude ECs (CD34+/CD31+), and only CD34+/CD31- subset is marked as ACs (CD34+/31-/45-/56-/146-) for collection (Figure 1). To simplify the process, CD144 can be used to substitute CD31 for exclusion of ECs. Freshly sorted cells can be seeded in culture conditions specified in the protocol for further expansion or used immediately for in vivo experiments. Clonal expansion of hBVSC subsets can be achieved by the FACS Aria autoclone system or limiting dilution method13,21. Unlike the typical heterogeneous MSCs, cultures of hBVSC subsets remain homogeneous even after long-term expansion. Representative morphology of cultured hBVSC subsets, purified from muscle biopsies of a single donor, is shown in Figure 2. Comparisons between typical MSCs and purified hBVSC subsets are summarized in Table 1. Figure 1. Representative sorting of the three subsets of human blood-vessel-derived stem cells (hBVSCs) from a single human skeletal muscle biopsy. Purity of each sorted cell population is further confirmed by post-sort analysis. Please click here to view a larger version of this figure. Figure 2. The three hBVSC subpopulations, sorted to homogeneity, exhibited distinct morphology in culture (left to right): myogenic endothelial cell (MEC), pericyte (PC), and adventitial cell (AC) (at passage 4, scale bars = 100 mm). Please click here to view a larger version of this figure. Table 1. Comparison of typical MSCs and multipotent hBVSC subpopulations. Identification and purification of hBVSC subpopulations represent a major advance in the comprehension of MSC ontogeny. There is increasing evidence indicating the perivascular origin of MSCs and the association between tissue-specific precursor cells and blood vessels22-25. In addition, the capacity to isolate homogeneous subpopulations of hBVSCs further aids the understanding of MSC heterogeneity and vascular cell biology26. In the past few years, MECs, PCs, and ACs have been individually identified and isolated through distinct protocols in separate studies. However, no attempt has been made to purify all three hBVSC subsets simultaneously from human skeletal muscle due to the difficulties to optimize the tissue dissociation procedure and the combination of selective cell lineage markers identifying MECs, PCs, and ACs altogether. Here we described a new cell isolation protocol that allows concurrent purification of MECs, PCs, and ACs from a single human muscle biopsy by modifying the tissue dissociation process and applying a new combination of selective cell surface markers (Figure 1). For the best outcome, the critical steps in the current protocol that require additional attention include: 1. Freshness and preservation of the tissue specimen; 2. Optimization of cell yield and surface antigen preservation by careful monitoring of the digestion process and adjusting the tissue dissociation time; 3. Precise calibration of the six-color flow cytometry. These parameters are to be determined by individual laboratory according to its specific supply/equipment setup. By implementing this new protocol, one can not only streamline the synchronous isolation of multiple hBVSC subpopulations but also facilitate utilization of hBVSCs for basic research and translational application, such as the comparison of differential cellular behaviors between hBVSC subsets and the optimization of single or combinatorial hBVSC subset(s) for various personalized therapeutic applications. However, the concurrent isolation of all three hBVSC subsets is presently limited to skeletal muscle due to the fact that MECs haven’t been identified in other human tissues. Besides, it is beyond the limitation of the current protocol to distinguish the transition and/or cellular hierarchy between these three hBVSC subpopulations. Characterization of freshly isolated and cultured MECs, PCs, and ACs has been separately demonstrated in prior studies MECs in culture maintain the expression of the myogenic marker CD56 but gradually lose the expression of the EC markers CD34 and CD144. At the clonal level, MECs express MSC markers, including CD29, CD44, CD90, and CD105, and display mesenchymal differentiation potentials such as chondrogenesis, osteogenesis, adipogenesis, and myogenesis. Additionally, clonal MECs retain their angiogenic capacity after long-term culture, forming capillary-like networks in Matrigel culture and participating in neovascularization in vivo21. PCs, fresh or cultured, have been shown to not only express MSC markers, including CD44, CD73, CD90, and CD105, but also exhibit mesodermal developmental capacities, for example, skeletal myogenesis, osteogenesis, chondrogenesis, and adipogenesis13. PCs robustly secrete a number of trophic factors, even under hypoxia, and serve as the regenerative units through their paracrine function, direct differentiation, and cellular interaction during the tissue repair/regeneration process ACs, similar to PCs, were shown to express classic MSC markers and differentiate into major mesenchymal cell lineages18. Together with PCs, ACs have also been proposed as one of the developmental origins of MSCs. A summary comparing the cell surface marker expression, differentiation capacity, and possible translational applications between typical MSCs and hBVSCs has been listed in Table 1. Recently, Tang et al. identified multipotent vascular stem cells (MVSCs) from the tunica media of large blood vessels in rat and human29. MVSCs not only differentiate into smooth muscle cells but also contribute to vascular remodeling and neointimal hyperplasia after vascular injury29. Whether MVSCs share developmental connections with BVSCs residing in the microvasculature and small vessels requires further investigation. The current protocol requires timely cell isolation from fresh human muscle biopsy, which, at times, may not be accessible in the clinical settings. Alternatively, based on a modified set of selective cell surface markers, it is feasible to purify MECs and PCs from cryopreserved human primary skeletal muscle cell cultures by flow cytometry30. This method allows prospective purification of two hBVSC subsets from banked human skeletal muscle culture for therapeutic purposes. Nevertheless, due to the lack of CD34 expression in cultured human muscle cells, it is not possible to further separate ACs with this particular protocol. J.H. received remuneration from Cook MyoSite, Inc. for consulting services and for royalties received from technology licensing during the period that the above research was performed. All other authors have no conflict of interest to disclose. The authors wish to thank Alison Logar for her excellent technical assistance with flow cytometry. This work was supported by grants from the Department of Defense (J.H. ), the Henry J. Mankin Endowed Chair (J.H. ), and the Ministry of Education and Science of the Republic of Kazakhstan (A.S.). C.W.C. was supported in part by the American Heart Association predoctoral fellowship (11PRE7490001). M.Corselli was supported by the California Institute for Regenerative Medicine training grant (TG2-01169). Peault, B., et al. Stem and Progenitor Cells in Skeletal Muscle Development. Maintenance, and Therapy. Mol Ther. 15, 867-877 (2007). Toma, J. G., et al. Isolation of multipotent adult stem cells from the dermis of mammalian skin. Nat Cell Biol. 3, 778-784 (2001). Zimmerlin, L., et al. Stromal vascular progenitors in adult human adipose tissue. Cytometry. 77, 22-30 (2010). Reyes, M., et al. Origin of endothelial progenitors in human postnatal bone marrow. The Journal of Clinical Investigation. 109, 337-346 (2002). Choi, Y., Ta, M., Atouf, F., Lumelsky, N. Adult pancreas generates multipotent stem cells and pancreatic and nonpancreatic progeny. Stem Cells. 22, 1070-1084 (2004). Zengin, E., et al. Vascular wall resident progenitor cells: a source for postnatal vasculogenesis. Development. 133, 1543-1551 (2006). Corselli, M., Chen, C. W., Crisan, M., Lazzari, L., Peault, B. Perivascular ancestors of adult multipotent stem cells. Arterioscler Thromb Vasc Biol. 30, 1104-1109 (2010). Ballas, C. B., Zielske, S. P., Gerson, S. L. Adult bone marrow stem cells for cell and gene therapies: Implications for greater use. Journal of Cellular Biochemistry. 85, 20-28 (2002). Chen, C. -W., Corselli, M., Péault, B., Huard, J. Human Blood-Vessel-Derived Stem Cells for Tissue Repair and Regeneration. Journal of Biomedicine and Biotechnology. 597439 (2012). Zheng, B., et al. Prospective identification of myogenic endothelial cells in human skeletal muscle. Nat Biotech. 25, 1025-1034 (2007). Okada, M., et al. Myogenic Endothelial Cells Purified From Human Skeletal Muscle Improve Cardiac Function After Transplantation Into Infarcted Myocardium. Journal of the American College of Cardiology. 52, 1869-1880 (2008). Crisan, M., et al. A Perivascular Origin for Mesenchymal Stem Cells in Multiple Human Organs. Cell Stem Cell. 3, 301-313 (2008). Park, T. S., et al. Placental Perivascular Cells for Human Muscle Regeneration. Stem Cells and Development. 20, 451-463 (2011). Dellavalle, A., et al. Pericytes of human skeletal muscle are myogenic precursors distinct from satellite cells. Nat Cell Biol. 9, 255-267 (2007). Dellavalle, A., et al. Pericytes resident in postnatal skeletal muscle differentiate into muscle fibres and generate satellite cells. Nat Commun. 2, 499 (2011). Chen, C. -W., et al. Human pericytes for ischemic heart repair. STEM CELLS. 31, (2), 305-316 (2012). Corselli, M., et al. The tunica adventitia of human arteries and veins as a source of mesenchymal stem cells. Stem Cells and Development. 21, 1299-1308 (2012). Campagnolo, P., et al. Human Adult Vena Saphena Contains Perivascular Progenitor Cells Endowed With Clonogenic and Proangiogenic Potential. Circulation. 121, 1735-1745 (2010). Katare, R., et al. Transplantation of Human Pericyte Progenitor Cells Improves the Repair of Infarcted Heart Through Activation of an Angiogenic Program Involving Micro-RNA-132 / Novelty and Significance. Circulation Research. 109, 894-906 (2011). Zheng, B., et al. Human myogenic endothelial cells exhibit chondrogenic and osteogenic potentials at the clonal level. Journal of Orthopaedic Research. 31, 1089-1095 (2013). Caplan, A. I. All MSCs Are Pericytes. Cell Stem Cell. 3, 229-230 (2008). 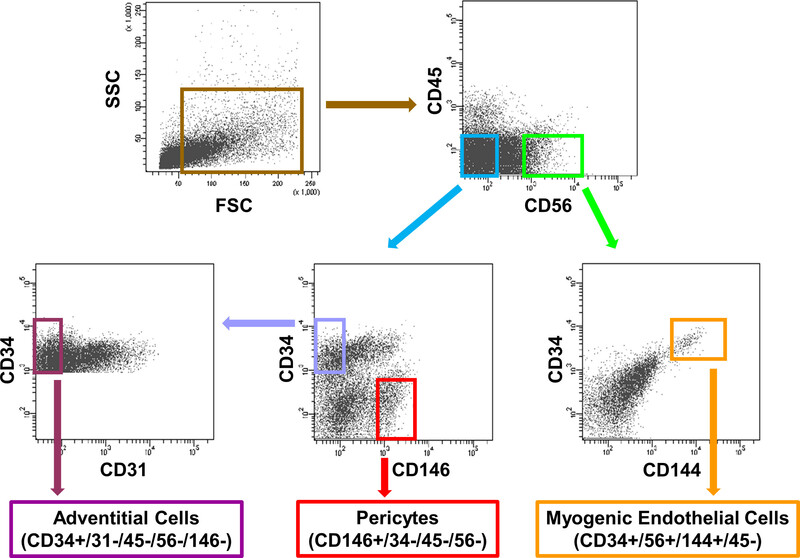 Feng, J., Mantesso, A., Sharpe, P. T. Perivascular cells as mesenchymal stem cells. Expert Opinion on Biological Therapy. 10, 1441-1451 (2010). Tang, W., et al. White Fat Progenitor Cells Reside in the Adipose Vasculature. Science. 322, 583-586 (2008). Krautler, N. J., et al. Follicular Dendritic Cells Emerge from Ubiquitous Perivascular Precursors. Cell. 150, 194-206 (2012). Phinney, D. G. Functional heterogeneity of mesenchymal stem cells: Implications for cell therapy. Journal of Cellular Biochemistry.113. 113, 2806-2812 (2012). Chen, C. -W., et al. Perivascular multi-lineage progenitor cells in human organs: Regenerative units, cytokine sources or both. Cytokine and Growth Factor Reviews. 20, 429-434 (2009). Lin, C. -S., Lue, T. F. Defining Vascular Stem Cells. Stem Cells Dev. 22, 1018-1026 (2013). Tang, Z., et al. Differentiation of multipotent vascular stem cells contributes to vascular diseases. Nat Commun. 3, 875 (2012). Zheng, B., et al. Isolation of myogenic stem cells from cultures of cryopreserved human skeletal muscle. Cell Transplant. 21, 1087-1093 (2012).